Found the Perfect Pumpkin at the Patch? Here’s How to Decorate it. After finding your pumpkin at the pumpkin patch, it’s time to search for a little carving inspiration, perhaps while sipping a pumpkin spice latte! Pumpkins will last a few weeks on your front step if left uncarved. We recommend carving only a few days before Halloween. If hollowing out a pumpkin isn’t your idea of a good time, you can try painting your pumpkins, or creating an artful pumpkin display on your front step. However, to be sure that the kids in costume show up, it’s best to have your Jack O’Lantern lit up. It’s a signal to kids it’s okay to come knocking for candy. Carving pumpkins is a favourite pastime in North America. However, do you know the roots of this favourite children’s tradition? It is said that the tradition of the Jack O’Lantern originates from Ireland, where strange lights appeared in the bogs and marshes at night. Not having an explanation for this natural phenomenon (which was caused by decomposing plant material coming into contact with electricity,) people created stories about a ghost doomed to wander the fields alone at night with only a lantern. Later, it became a common trick for kids to scare the neighbours, running through the fields with hollowed out turnips and beets as lanterns. You’ll get the best choice of pumpkin if you go directly to the farm to get it. Pumpkins are best when left to cure in the field for a few weeks. 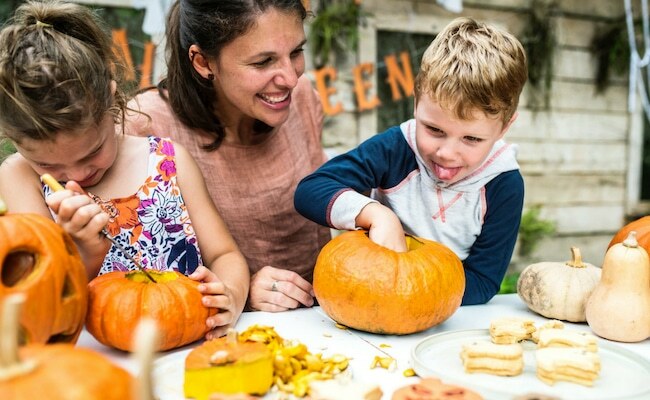 Kids love to get their pumpkin from the farmer, and many farms have special events and activities planned. Pumpkin carving is the traditional way to enjoy the season. To do this, simply remove a circle of pumpkin around the stem, pull it out, and scoop out the insides. Using a small knife (or a special carving tool), you can cut out shapes, spooky scenes, or a face. There are a great many stencils you can download to use, as well. If scooping and cutting don’t appeal to you, or if you have small children that aren’t ready to handle a knife, you can also try pumpkin painting. For best results, start with a very clean surface. Try a light solution of bleach and water to remove any bacteria that can cause rotting. Next, you can paint your pumpkin with acrylic paints. Try funny faces or spooky designs. Small painted gourds lend themselves well to a tabletop display. Halloween is a ton of fun, but it also poses some risks for kids with allergies. This great project helps to keep kids with allergies safe. Homes that provide non-food treats for kids with allergies can place a pumpkin that is painted in teal on the step to let parents know that safe treats are available. The Teal Pumpkin Project can be another fun Halloween DIY project. Providing non-food tricks and treats is a fabulous way to be inclusive and a good neighbour! The pumpkin patch at Barrie Hill Farms is open from late September to the end of October. Visit us to find the you perfect pumpkin for Halloween.